Clara (Jenna Louise Coleman) & the 12th Doctor (Peter Capaldi) in a wickedly creepy, yet delightful scene. The household are Whovians to varying degrees, but all of us felt fairly equal trepidation with the New Doctor: the Twelfth Doctor played by Peter Capaldi. It isn’t that we doubt Capaldi as an actor. It’s just that we admit to liking the younger Doctors–and Series 8, Episode 1: “Deep Breath” called us out on it. 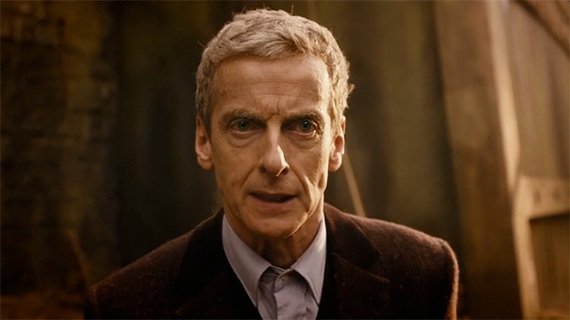 The first episode of the 12th Doctor (written by Steven Moffat) addresses the issue of a dramatic (backwards) shift in the age of the Doctor head-on. The Ben Wheatley directed episode opens with a dinosaur in old London–not subtle. When Matt Smith took over from David Tennant, his antics during regeneration could be described as goofy, the same antics played by Capaldi could easily misconstrued as senility. Tennant ran around in nightclothes, but Capaldi’s historical dress accentuate elderly over silly. Then there is Clara’s (Jenna Coleman) response to the new face and disoriented Doctor. 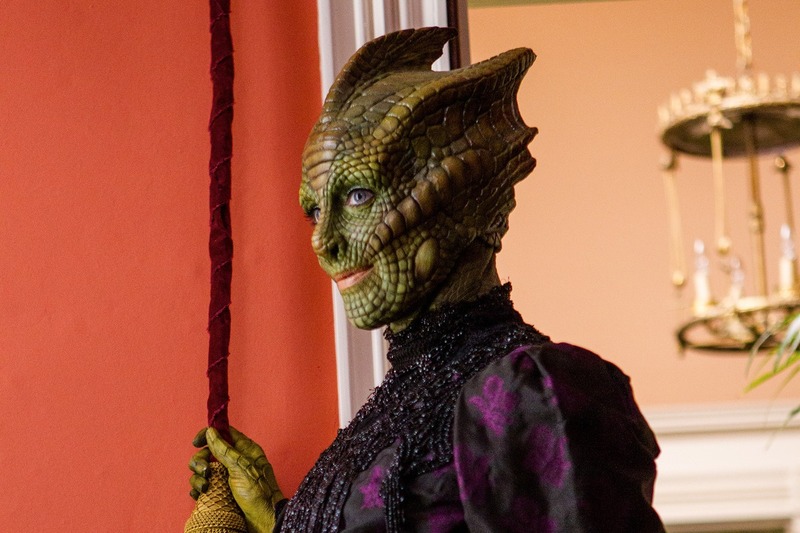 Her response should harken back to Rose’s (Billie Piper) discomfort with the Christopher Eccleston-David Tennant transition during Series 2, but Madame Vastra (Neve McIntosh) calls her on confusing the Doctor as a dashing young love-interest rather than the very old Time Lord that he actually is. 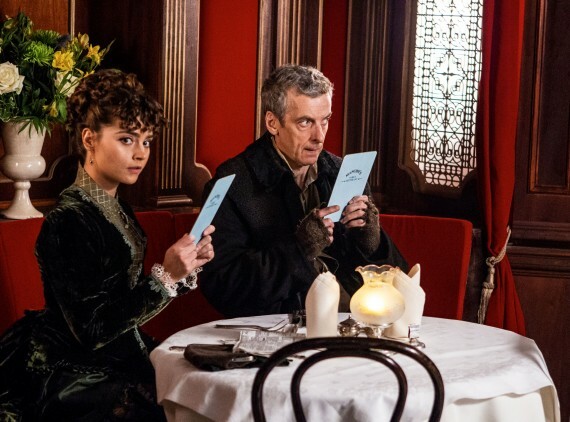 It is soon made apparent that the episode is using Clara as the audience’s avatar, both in guilt and self-defense. And bless it, Moffat offers a balm. (Have tissues ready). Besides the challenging of ageism, the episode explores the question of pretenses, veils, facades. Capaldi’s Doctor is not adjusting to his old face with any greater ease, wondering “who frowned this face,” in a gorgeous dialog with a homeless man in an alley. “Where do the faces come from?” “Why’d I choose this face? Am I trying to tell myself something?” I love the accompanying question posed to the “regenerating” villain: “If you replace the parts often enough, are you still you? How many generations until you are not you?” (may have paraphrased). “Deep Breath” punches the emotional core with its focus on lost and lonely creatures. The discombobulated Doctor and companion are juxtaposed to the household relationships between others who are out of time and place: Madame Vastra and Jenny Flint (Catrin Stewart) and Strax (Dan Starkey). A central thrust to connect character drama and the criminal-mystery is in the dilemma of destroying a complete creature for one useful part? And what of that facet where a creature is destroyed to hide what it was that was taken from it? It took time adjusting to Capaldi, but we were won in an episode. We were equally impressed by how Clara had finally become a fully actualized character for us in one episode. Yes, we know that she had more than a full season for characterization, but after an intriguing play at a Jack Harkness-type character, they flattened her out and she became a mere vehicle for Smith’s departure. She’s back. “Deep Breath” offers humor and horror and a really, really smart introduction to the 12th Doctor. We are feeling vastly reassured having seen it. Of note: It will be worth your time to revisit “The Girl in the Fireplace” (S2, ep4: Tennant/Piper), wherein we realized that this new transitioning of the Doctor isn’t the only regenerating episode to reference “The Girl in the Fireplace.” The episode also rewards long-time viewers in other ways…yes, Sean winced when 12 rejected the notion of wearing a long scarf.